Sections SEARCH Skip to content Skip to site index Food Subscribe Log In Log In Today’s Paper Food | Gumbo, the Classic New Orleans Dish, Is Dead. Long Live Gumbo. Supported by Rich in flavor and history, the dish is no longer a fixture of local restaurants. Some chefs see that as a chance to reinvent it. ByBrett Anderson Jan. 8, 2019 NEW ORLEANS — Decades ago, soon after moving to this city from India, Arvinder Vilkhu began telling his wife and children, “If we ever have a restaurant, we must have a curried gumbo.” Mr. Vilkhu had tasted his first gumbo in 1984 during a job interview at a New Orleans hotel. “I was so much in love,” he said of the rich dish, something between a soup and a stew. He began developing his own distinctive version after immigrating here later that year. 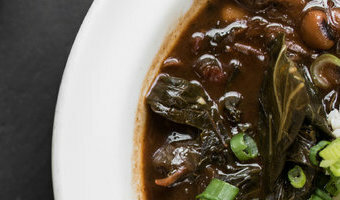 But it wasn’t until 2017, when the family opened their Indian restaurant, Saffron Nola, on a … [Read more...] about Gumbo, the Classic New Orleans Dish, Is Dead. Long Live Gumbo.